Writing as the Silver Age House of Mystery headliner "Robby Reed," Kirk Kimball offers his "blogazine" covering all manner of sweetly insane retro goodness. 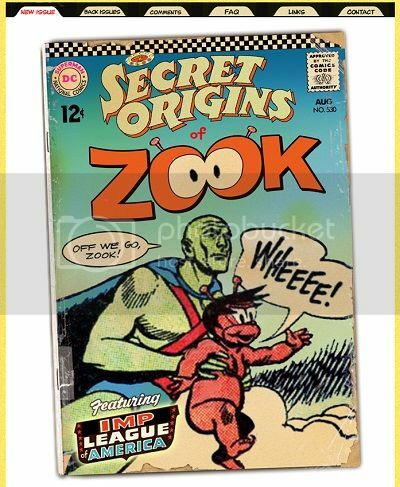 In this edition, Kimball looks at our own Zook, offering two distinct newly designed logos, faux covers, observations on his relationship to J'onn J'onzz, an extended look at his origin story, that rare accurate rundown of his powers, and even inclusion in Kimball's various all-imp fan fic teams. Check it out! This isn't a great cover for a lot of reasons, but ones specific to Zook include pushing a diminutive figure too far into an obscuring background and making an already problematic pidgin-speaking caricature even more cartoonishly ineffectual with the head shaking. Anyone else hear Micky Rooney in yellowface delivering that dialogue? Still, it's the only cover to offer true Zook-speak, and the balloon helps make you aware that he's there, even if the framing and angle of the image leave a lot to be desired. Zook is arguably as visible as his partner, but is still whining instead of using his own powers to help. Admittedly, Zook always fretted before taking action, but then stepped up, which isn't reflected. Here, Zook demonstrates one of his signature powers, elasticity, while taking up more cover space and punching his master/mentor/pal in the jaw. Hey, sometimes negative attention is better than none at all. 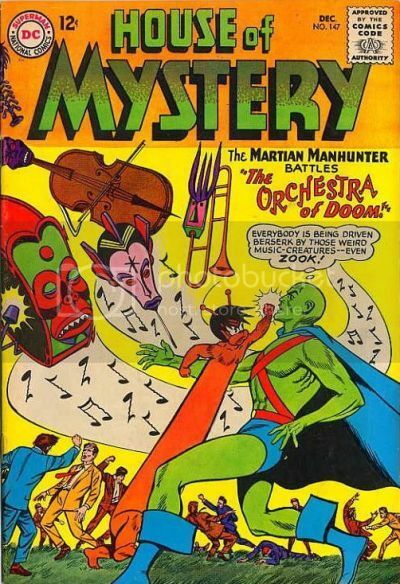 Besides being easily the most prominent Zook frontpiece to date, this was also my #1 Martian Manhunter cover of the 1960s overall. It was the start of the pair's series of strips after moving out of the Detective Comics back-up spot into cover featured star status (for nine non-consecutive issues, anyway.) Even the Idol-Head of Diabolu got a mention! Following the winter hiatus, I wanted to get back to the Awesomest Alien Atlas Art Anytime commissions I've collected with a strong, Zook-related restart. 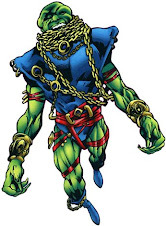 Thantos, the 3-In-1 Man is part of the Martian Manhunter and Zook's shared rogues gallery, as well as one of the most powerful and unique of that often conceptually anemic lot. After probably decades without any artists giving the character a thought, my best friend "Illegal Machine" did a classic style doodle for me, then decided to really work him over with a New 52 redesign that raised the bar on my expectations for a legit, pay-for-play commission. I figured Cody Schibi was up to the challenge after his fantastic interpretations of Mr. Moth, The Mercurian Renegade, and Diabolu the Wizard (with his Idol-Head). Perhaps I was still too in love with the Ill Mac's alterations, but my initial reaction to Schibi's whimsical, surprisingly faithful rendering of Thantos was muted. "Oh, a tricycle. I get it." But the truth is that I didn't, and I had to work it out in my brain. Both my best friends and my girlfriend not only loved it immediately, but if I recall correctly, the Ill Mac himself declared it Schibi's best piece for me yet. Was I being "that guy?" The nerdy fanboy who couldn't let go of his rigid mental image of a character to appreciate fine art? Was I seriously trying to rationalize the nature of the piece with dumb thoughts like "maybe the bike was one of the artifacts Thantos needed to collect to permanently cross over to our dimension? Maybe the tryc represents his innocent desire to escape?" What finally got me to stop worrying and appreciate this as the bomb was my recollection of the Thanos-Copter. For those who don't know, Thanos is the "Mad God Titan," an extraordinarily powerful cosmic demigod whose courtship of the literal embodiment of death has led to the murder of billions, including his own mother. Back in the 1970s, there was a tie-in comic to a segment of the PBS children's program The Electrical Company called Spidey Super-Stories that featured Spider-Man in very simple stories for early readers. For some reason, the creators of one issue decided to use Thanos of all characters in a story, and to treat him as a low level gimmick villain who tries to disrupt the Women's Liberation Movement while flying his own self-branded helicopter in an adventure co-starring The Cat involving lots of forced dog puns. I could have probably broken that synopsis up, but I felt it needed a breathless run-on sentence to capture the insanity of a tale that ends with NYPD escorting a handcuffed Thanos to a squad car. This is the guy who turned up in the stinger at the end of Marvel's The Avengers, so of course this bit of Bronze Age kids' ephemera is now a staple of "Things You Didn't Know" lists, and ThanosCopter is even the pen name of a contributor at The Outhouse. What we have here is Thantos-Cycle. In an alternate universe, Martian Manhunter got his own Hostess ad and Thantos rode it in pursuit of the real fruit filling and flaky goodness of a Fruit Pie, only to be cast into another dimension with a Twinkee as his consolation prize. Now I get it, and thanks to Cody Schibi, it's a big delight! 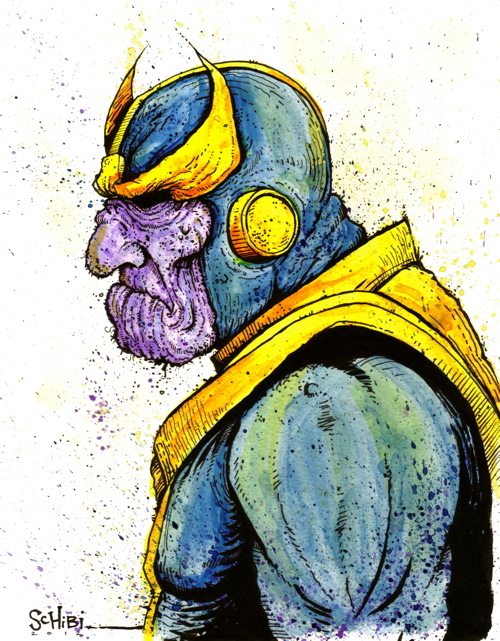 Visit his blog Drawing A Blank, and don't overlook my other best friend's Thanos commission for a nice thematic closing! Appropriately enough, 2013 was a banner year for the 3-In-1 Man. At least three times as many artists drew the character as I ever knew of before, meaning the one artist who co-created him, Joe Certa. 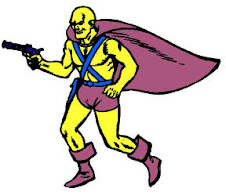 Enrique Alcatena decided to draw Thantos by March of last year, and was quite possibly the first illustrator to do so since the villain's debut in 1967. I was unaware of that having happened until many months later, after I'd already gotten Thantos commissioned at Comicpalooza and my buddy “Illegal Machine” had redesigned the character as seen here. However, I ran the Ill Mac's first pass on Thantos in April, several months after he had doodled the character for me on a whim. So, was Alcatena or Ill Mac first to revisit Thantos after 46 years in limbo, or are we all fooling ourselves about the obvious 3-In-1 Man Zeitgeist? Click the picture above to see the full set of custom figures sculpted by "Jackknight92" for this assortment! 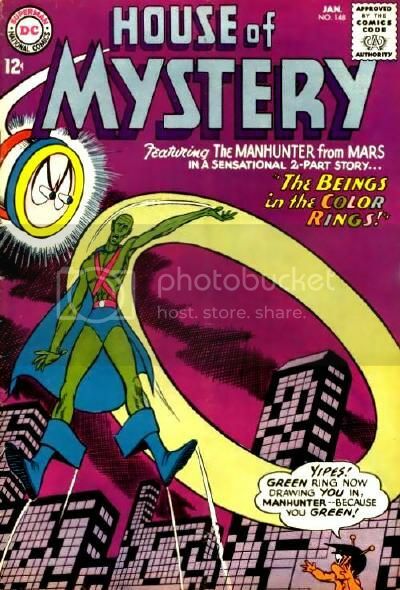 "J’onn J’onz had his own feature from 1955-1969—first in the back of Detective Comics and then in House of Mystery. 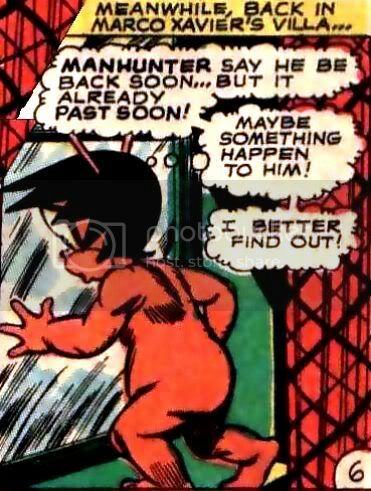 About halfway through his run he acquired an alien pet from another dimension named Zook who talked in a kind of broken english/baby talk... With more powers than even Superman, it’s hard to imagine why the writers thought the Manhunter needed some help—especially from such a goofy character." 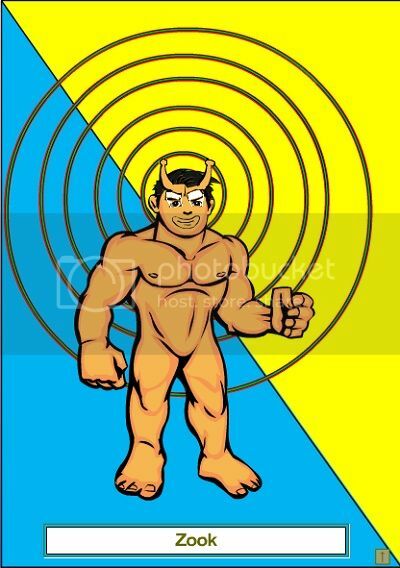 Despite his best intentions to post the art for 55 DC Silver Age hero themed poker cards five days a week, it took him most of the year to complete the task, but it was worth the wait. 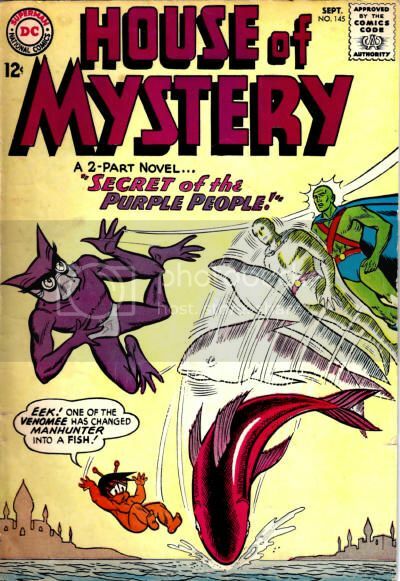 To answer his question, DC was trying to target a younger audience for the "Manhunter from Mars" strip, especially ahead of his transitioning from a back-up to lead feature. 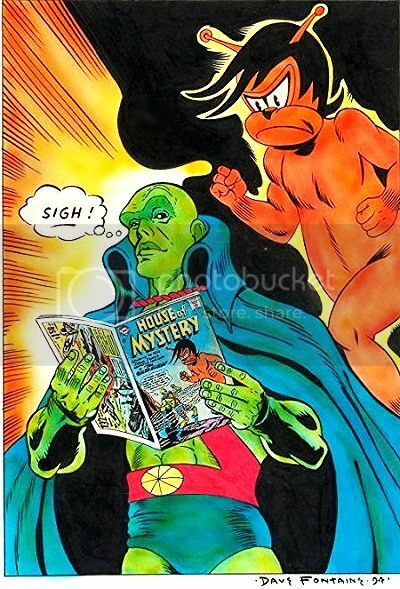 Zook pandered to the juvenile audience, and gave J'onn J'onzz someone to fight monsters of the month with after the Diabolu Idol-Head was opened. Also, it allowed Bostick to place a character largely unchanged visually in his first half century of operation squarely in the 1960s by pairing him with his otherdimensional friend in a delightful rendering! It should come as no surprise that I've read my share of Martian Manhunter stories, but certainly nowhere near all of them. For instance, I hadn't bothered with the back-up from Detective Comics #324, since I'm not into dinosaurs, kaijū, or anything else of that sort. I wondered why Alcatena would choose it as the subject for a piece, and it turned out to be an offbeat highlight from that period. I covered the monsters yesterday, but I'll have to give the full story a proper synopsis. For more examples of Alcatena's fine taste, check out the Quique Alcatena blog, or if you prefer to specialize, Superheroes x alcatena. As recorded on cave etchings, in ancient times the sorcerer Marlon created a rampaging creature "to wreck havoc among the people." The stone carvings also described at least three other beasts of unrevealed origin with the potential power to stop Marlon’s creature. In modern times, archaeologists discovered the caves in what was now a remote resort area. Within, they excavated the petrified creature from the cave floor. A lightning bolt happened to strike and revive the creature, which began to terrorize the archaeologists. The Manhunter from Mars was contacted in Middletown, and managed to fly to the site, temporarily contain the creature, and decipher the ancient script on the cave wall. 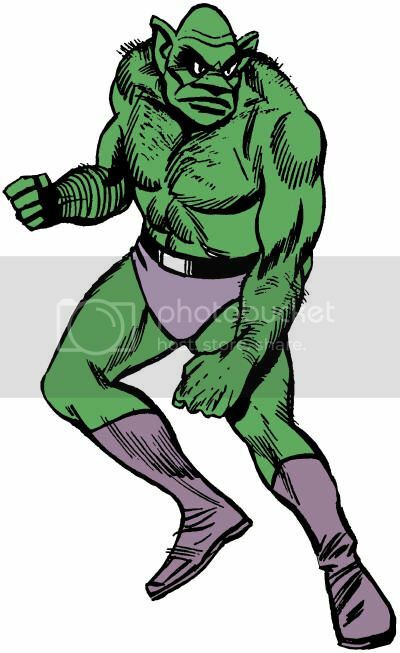 J'onn J'onzz was unable to read a deteriorated area that identified which of several beasts could halt what eventually became dubbed "the juggernaut," so he randomly selected one and used his shapeshifting powers to become "this one-eyed beast." 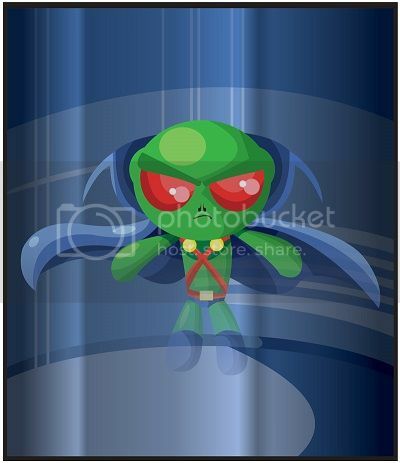 In this form, J'onzz could fire a destructive ray-beam from his eye, but it proved ineffective against the juggernaut. Worse, the one-eyed beast was physically weaker than the juggernaut, who nearly crushed J'onzz's throat before he could return to his Martian form. The Manhunter next tried "that funnel-mouthed beast," which turned out to shoot a consistent stream of flames from its nose. "The flame-throwing creature is powerless against the beast, too!" 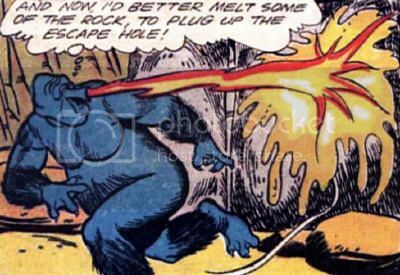 Even with flames that could instantaneously blast or melt large rock slabs, J'onzz was soon forced to run from the fight. 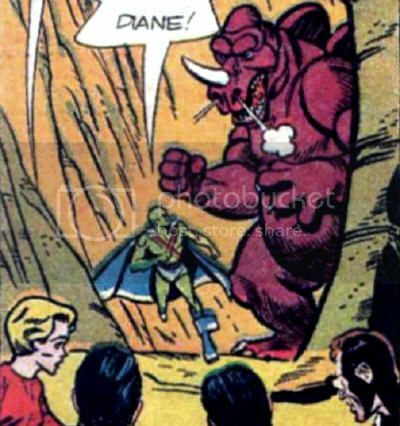 Theorized as a byproduct of the flames burning inside the funnel-mouthed beast's body, J'onzz was unable to revert to his Martian form, and was lethally vulnerable to conventional gunfire in the adopted form. 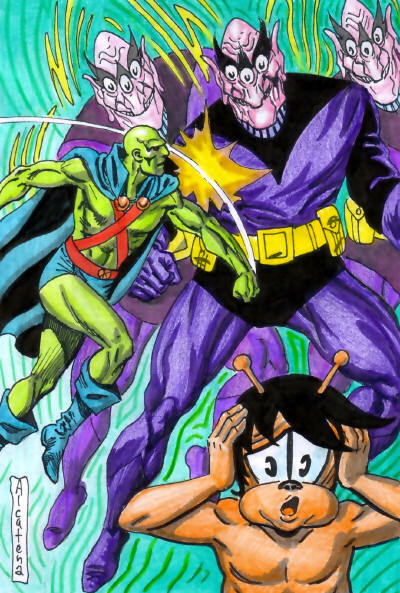 Unable to speak, J'onzz was saved through his rapport with his otherdimensional sidekick Zook, whose antennae could detect the true nature of the Martian shapeshifter, then froze him to squelch the flames within. J'onzz finally took the form of "that blubber beast," which was able to contend with the juggernaut's direct assault. The blubber beast forced the juggernaut to the ground, then "spread itself around the juggernaut like a blanket!" The blubber beast tightened its form over the juggernaut until it crushed the life out of it, then the Manhunter promised to "bury this beast in deep ocean-- where no lightning can ever reach it!" 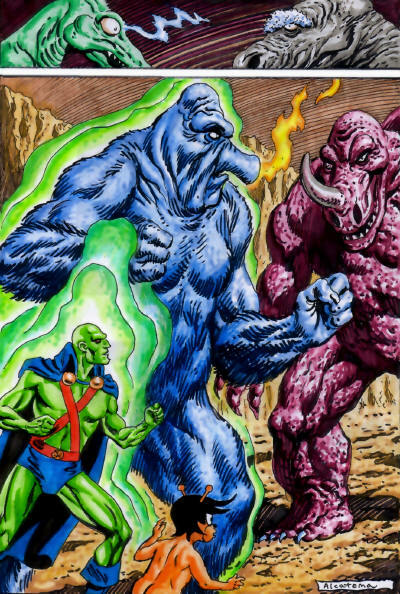 The juggernaut had been able to fight J'onn J'onzz to a standstill, but it was unclear if the blubber beast had similar might, or merely powers the juggernaut could not counter. Combo pack edition: $4.99 US • Retailers: This issue will ship with three covers. Please see the order form for details. So hey, when you were buying 50+ variant covers for the debut issue and 3+ for every consecutive issue, did you know that you were investing in a 14 issue maxi-series by two different series writers and probably a dozen series artists in which nine issues were direct branded tie-ins to two crossovers (not counting the four Villains' Month stunt issues that really had little to nothing to do with the title?) I've bought every properly numbered issue, but only bothered to read four or so. 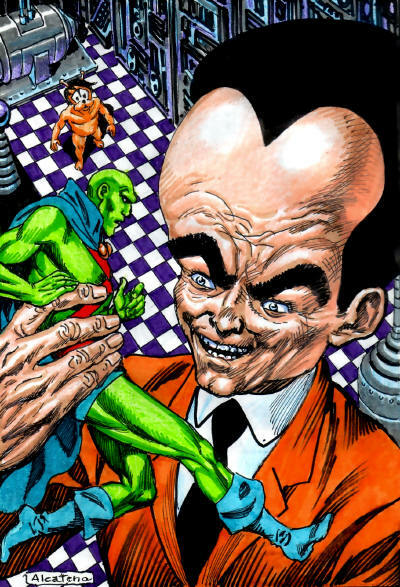 Those Martian Manhunter back-ups sure were a disappointment, since what little they revealed about the character wasn't to my liking, but mostly they were just pointless expansions of the lead stories. I've been flipping through the Forever Evil tie-ins, and after reading the first, it seems like the subsequent ones spin their wheels in the exact same mud where I left off. Maybe Geoff Johns started this with the best intentions, and got forced off by Diane Nelson & company, but this entire volume turned out to be meandering ancillary material for other projects, and now we get some half-assed coda? And the sad truth is, since I'd already started following this crap, I'd have probably bought #15 by the next creative team. Luckily, DC had the courage/greed to give me a jumping-off point instead, and I'm frigging taking it. Even after my fairly definitive rant about how I wasn't going to buy this book, I still had a "but" in my back pocket. Maybe the price would come down to $2.99? Maybe there would be a tie-in Martian Manhunter book? Nope. I still like Mike McKone's new art style, which reminds me of Dusty Abell, but y'know, I didn't like Abell as much as classic McKone, knowwhatImean? I'm guessing the JLU will take part in the start of a new Rann-Thangar War, which would explain Hawkman's absence from the cover but clear involvement per the synopsis. I definitely want to see the Alien Atlas all up in that, so when the trade paperback arrives, I'll probably be there. Until they get around to the Secret Origins issue for the Sleuth from Outer Space, I'm done with DC monthlies. By the way, in the final issue of the series, Stormwatch is rebooting to its New 52 relaunch incarnation of Adam-One, Jenny Quantum, the Engineer, Apollo and Gimpy Midnighter. Maybe they'll use the weekly event series Future's End to do the stuff they meant to do three years ago? Reverend Delroy was the spiritual leader for the First Baptist Church of Wilmington, Alabama in 1963; which was destroyed in an arson attack. Delroy learned that the white community, led by Chief Oxblood Banner, intended to blame the Negroes for the fire if they attempted to peacefully demonstrate against the act of violence. Following the passing of a little girl caught in the fire, Mary Lou Wilson, the protest drew participants from many surrounding states, "as far away as our nation's capitol." Mark Hampton was associated with the Students for Non-Violent Change and based out of the University of Chicago. Hampton was working with Reverend Delroy to use his church as the headquarters for new voter registration of Negroes in the heavily racist small town before the arson, and helped rally the protest held afterward. Police chief who collaborated with government agents in the cover-up of arson at the First Baptist Church, a political entity for the local African-American community. Enjoyed smoking cigars and oppressing minorities. Quote: "Hell, that ol' church was jus' a tinderbox... Maybe it got a mite too heated up in this unseasonable weather." 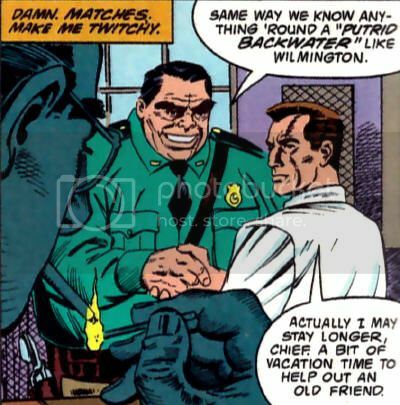 A seemingly mild-mannered policeman and childhood friend of Spencer Lee. Despite outward shows of sympathy over the immolation and eventual death of a child in the fire, Turner turned out to be one of three assailants who started it, and even battered the child with a gas can. Turner also took part in the brutal police crackdown on a peaceful demonstration that followed. Turner was last seen returning home to kiss his wife and watch his son play ball with a dog. Quote: "I'm surely sorry 'bout your daughter, folks." Partner of Ofc. Turner who, while informing the parents of Mary Lou Wilson of her death, also tried to harass and intimidate them should they attempt to shed any light on the matter. 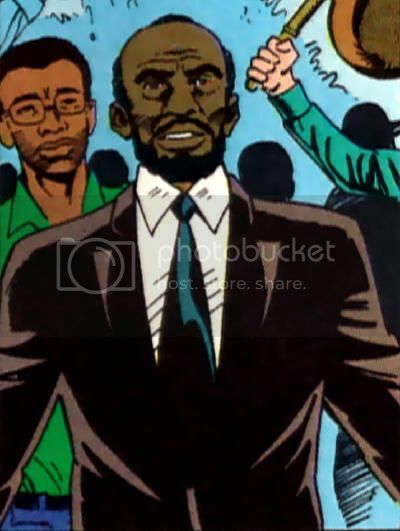 I have always really liked the John Jones incarnation of the Martian Manhunter character from DC comics. He's so much cooler as a ghostly noir detective. I think he should just stick to the fedora and trench coat. So much better than a blue speedo with red suspenders and a cape. It's 4:30 a.m. I've killed a bottle of nasty Moscato made palatable by Diet Mountain Dew and the last of the ice cream that ruined me for all others, Blue Bell Homemade in the Shade. I am not up for in-depth blogging this evening morning. Worked late tonight and likely to do the same tomorrow, day six of a seven day week. 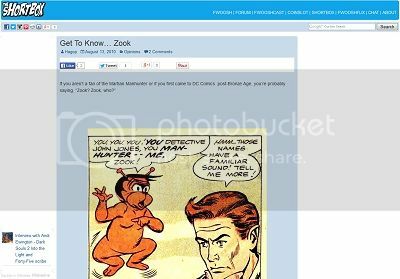 How about you guys read this brief, heavily illustrated primer on Zook, including his appearances in Superman/Batman at The Shortbox? The last paragraph poignantly sums up why the world still needs this otherdimensional pet. By all rights, I should be excited about Justice League United. I correctly guessed back in August J'Onn J'Onzz would be moving to Canada, and was all for it. I've never been blown away by Jeff Lemire (and outright hated his Atom serial,) but he's a popular and respected writer I've been entertained by. I've previously mentioned that Mike McKone is one of my all-time favorite Martian Manhunter artists. I'm rather pleased that he's having none of that extraneous alien crap on J'Onn's head seen throughout the New 52, and he's using a clean, iconic chest symbol instead of that ridiculous flowery thing David Finch had some other aesthetically-challenged people drawing. This is a solid creative team. Looking to the line-up, there's some swell people for the Martian Manhunter to interact with. Supergirl is one of my favorite DC heroes, and she has history with the Alien Atlas dating back to 1968, though their most memorable encounter was in 1977 (with fun shared villainy in 1980.) For some reason, I just get a bigger kick from the Martian Marvel interacting with the Maid of Might over the Man of Steel. Animal Man hosted possibly the finest Sleuth from Outer Space guest appearance in his first volume, where J'Onzz told Buddy Baker how much he wanted the animal rights activist in the League because of the importance of what he represented. It's swell that they'll be serving together on the same team. 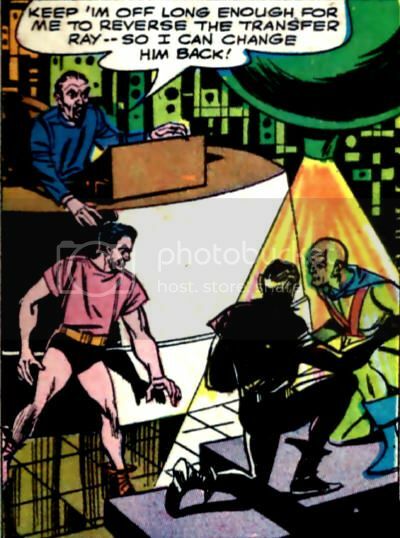 I also like when J'Onn J'Onzz interacts with his fellow 1950s sci-fi heroes, which is surprisingly uncommon, and Adam Strange is the archetypal example of that DC staple. I even prefer Adam's redesign here over the one from a few years, even if he does look like the 1987 Lazer Tag champion and/or one of Captain Power's Soldiers of the Future. No flies on this lot. I'm not buying it. I mean, literally, I most likely will not purchase this monthly comic book. The reason why is that I can't seem to take pleasure in DC Comics and their universe anymore. I've always bought DC books, but I really got into them in the early '90s, investing emotionally, intellectually, and financially into their line. 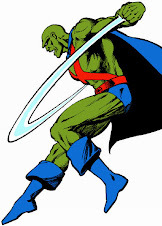 In the case of the Martian Manhunter, my discontent began around 1999, when I found myself greatly disliking his solo series despite having previously been a fan of the work of chief creators John Ostrander and Tom Mandrake. Heading into the '00s, the culture of the company slowly began to change in a way that alienated me. Infinite Crisis was a major turning point, as power within the company shifted to new hands, and its output geared further away from my interests. After having unhappily followed the '98 series for three years, I only gave a 2006 mini-series that promised to radically revise the Martian Manhunter one issue to hook me, and it failed. I kept cutting back on my DC purchases, and became ever choosier in which Manhunter appearances I bothered to pick up. When J'Onn J'Onzz was killed in the first issue of Final Crisis just two years later, I felt a bittersweet relief, hoping the character would return someday to be handled better. His death lasted little more than a year, when he returned in classic form, and I spent a year buying his middling appearances in the bi-weekly series Brightest Day. Whatever grand plans there may have been to spin titles out of that maxi-series were aborted in favor of the line wide reboot, the New 52. 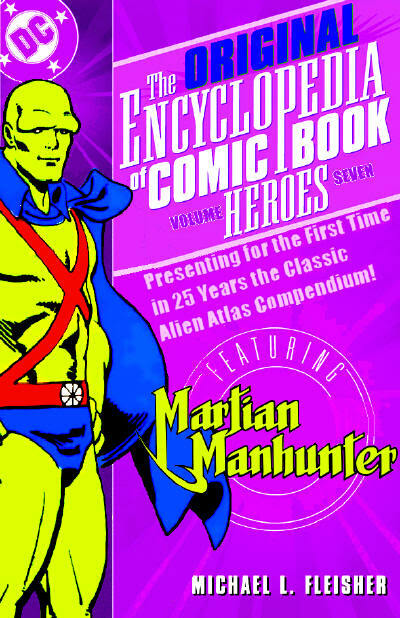 I spent most of 2011 failing spectacularly to guess DC's plans for the Manhunter from Mars. No solo series ever materialized, but I was very enthusiastic about the possibilities that came with his joining Stormwatch as part of that team's integration from Wildstorm continuity. Unfortunately, the book was garbage, which I once blamed on writer Paul Cornell, until I started watching Doctor Who and realized that he was one of the finest members of their screenwriting stable. 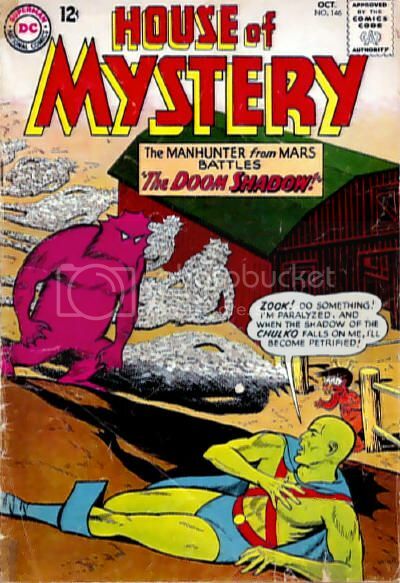 The title went through creative turnovers until the Martian Manhunter arbitrarily left the team book after only a year, realizing not one iota of my hopes for his time there. 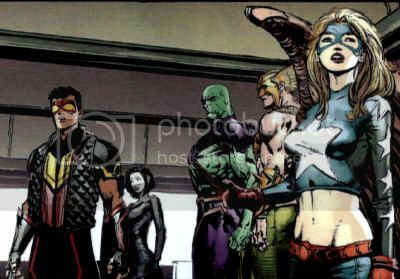 Late in 2012, Justice League of America was announced, and I gave Martian Manhunter's possible interactions with his new teammates a lot of thought. I was still energized by the potential of the New 52. J'Onn was on a rival Justice League whose book would host a new Manhunter solo strip! Unfortunately, the strip was handicapped by a gimmick of tying into the lead story of each issue, which was produced by an entirely different creative team, and likely only existed to justify charging a dollar more than standard books in DC's line. Further, the title's hot artist left after something like three issues, and the superstar writer bolted a few months later. I stopped reading a comic I continued paying $4 a month for, including a six part, three book crossover event. 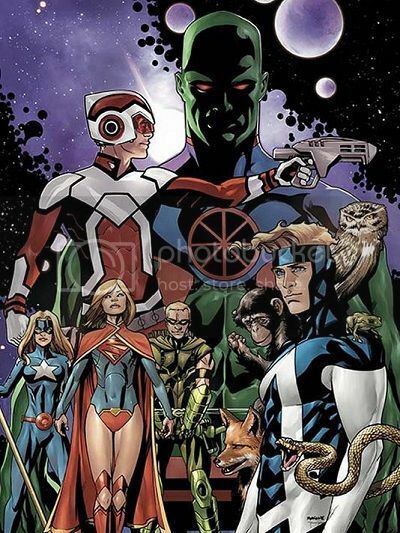 The team behind the Martian Manhunter strip was supposed to take over the book for a five month solo/spotlight arc, but that ultimately became a team-up with Stargirl used to spin the titles' wheels as a separate event mini-series by the former lead creative team played out, and art chores deteriorated into catch as catch can. I read the first Forever Evil tie-in, was unimpressed, and continue to lightly skim/toss through further issues in the story arc, just as I had in my final months buying Stormwatch. At this point, I'm simply all out of love. Justice League United might be awesome, but for how long? Mike McKone isn't a monthly artist, so he'll hopefully at least make it through the initial arc before being replaced. 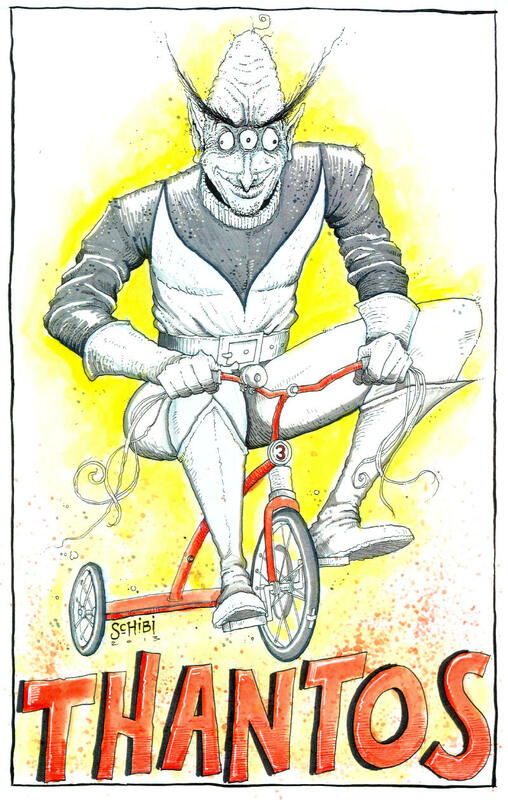 Jeff Lemire is increasingly in demand, and he only lasted nine issues on his previous team book. Justice League of America launched with over fifty variant covers and mounds of hype, but in retrospect only existed to set up the "Trinity War" event, and has now fallen to pieces. I have no real reason to expect the new book to last a year, and if I still want it then, I can buy a trade paperback. Even if Jeff Lemire had substantial plans for the Manhunter, there's no guarantee the next editorial mandate won't quash them, or that Lemire won't up and sign an exclusive deal with Image Comics before the debut issue even sees print. The New 52 is defined by fickle impermanence, so I can't motivate myself to commit to purchasing any of its product on a periodical basis. I've been burned so often, I wouldn't even want to place a bet on Justice League United coming out in a recognizable form at all. I won't. I call enough on these shenanigans, and expect to draw the line at never mind. I've previously spoken highly of Victoria Lynn Schmidt's 45 Master Characters: Mythic Models for Creating Original Characters [Revised Edition] using Martian Manhunter and Commander Blanx* as examples of how her archetype theory could beneficially inform the work of future comic writers. The book focuses on primary protagonists and antagonists, though the structure would be sustainable across an ensemble so long as they fit the same molds. Schmidt also devotes a couple dozen pages to supporting characters, and in the absence of 45 Minor Characters: Creating Original Subordinates, this is an area where the author falters. I've been using HeroMachine 2.5 to build the art for these articles, because I like how it reflects developing a character from the old school roleplaying game model. I've also toyed with 3.0, but it's almost too flashy for my intentions. I tried to do a Zook in both, and neither could get the job done without serious tweaks in MS Paint, and even then I think he looks off. That's how Zook was processed through Schmidt, as well. The author offers three sets of supporting character types: Friends, Rivals, and Symbols. Zook clearly belongs in the former, which has four sub-categories: The Magi, The Mentor, The Best Friend and The Lover. The quartet only get eight pages of dissection, and the types are vaguely sketched. Common sense would assign Zook the role of Best Friend, but none of the avenues for conflict offered by the author (ineptitude, jealousy, fear, neediness, poor judgment) match Zook's method of operations. 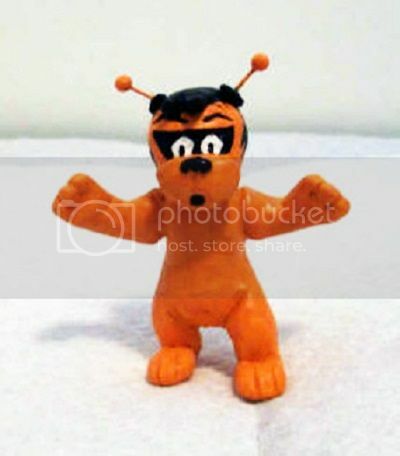 Zook was actually quite competent and generous of spirit, yet while very helpful, was still a sidekick in need of motivation through the Manhunter from Mars. As defined by Schmidt, Zook better fits The Lover as embodied by Toto, who "has Dorothy's unconditional love, and she risks all to save him." 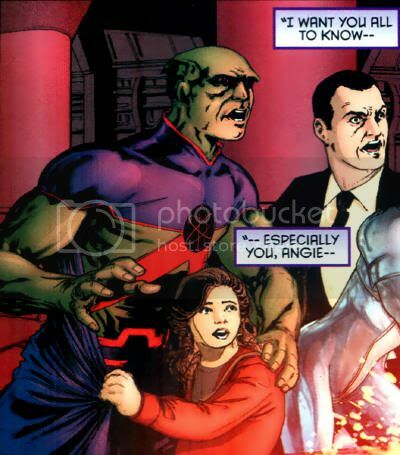 The roles were reversed though, as J'onn J'onzz had Zook's abundant love and support, which the Alien Atlas was ultimately ambivalent towards. 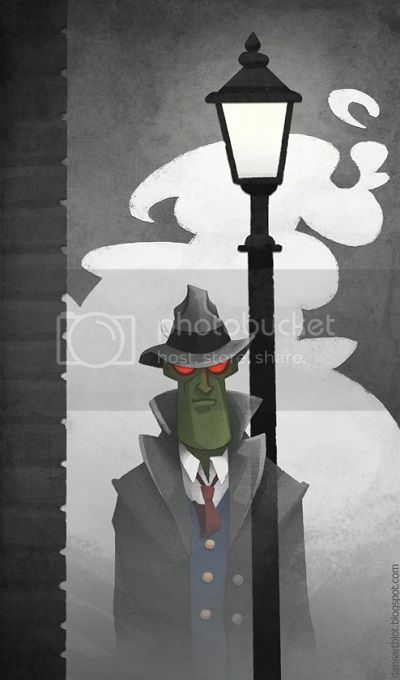 J'onzz kept Zook cooped up in a mountain hideaway while he maintained a life as a police detective in Middletown. 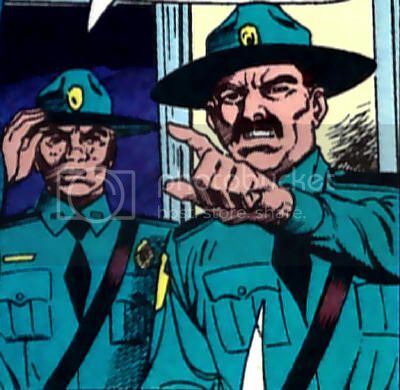 When J'onzz moved to the Mediterranean to pursue Vulture, he left Zook behind in the States without explanation. Most of Schmidt's analysis of The Lover type is geared toward an intimate, romantic relationship, which extends to her suggested story developments. However, one section is key: "You wouldn't think badly of a hero who snubs her friend when she's busy, but you'd think badly of a hero who snubs her lover for any reason... we need to know, because it tells us something about the hero's personality." 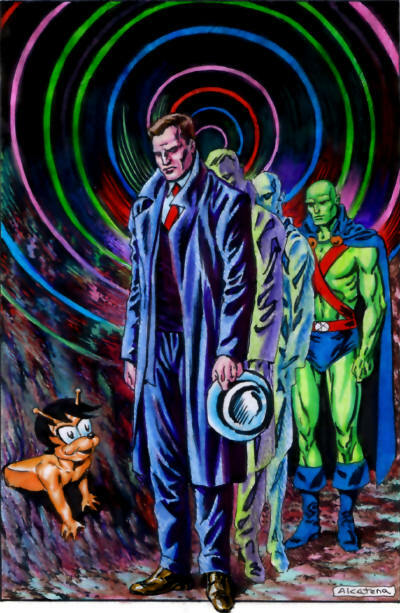 Why couldn't J'onn return Zook's love and keep his pet by his side, since Zook was a proven asset? Schmidt referenced characters from Seinfeld a number of times in her book, but her structure doesn't support the core cast of the series. Jerry is the titular hero of the show, so he would be classified under the major archetypes. Jerry is the straight man, and probably the least interesting and least funny presence on the show, but everything revolves around his life. George is the Best Friend, but despite occasional lapses into a physical/romantic relationship, Elaine is not The Lover to Jerry. Kramer is only a proximity friend to Jerry, the oddball next door neighbor. Jerry desperately needs his supporting cast, and none of the three primary members have sustainable relationships with one another, only through their mutual friendships with Jerry. Neither George nor Elaine are strong enough to support their own ongoing series, but Kramer has a wholly separate circle where he could serve as the lead protagonist. However, in the context of most Seinfeld episodes, Kramer is subordinate to Jerry and is presented through his tangential relationships to Jerry's other supporting characters. They can't all be Jerry's Best Friend, and they don't fit the other three Friends archetypes, so how do you write Seinfeld under Schmidt's model? The same problem is found here. Captain Harding could have been The Magi to John Jones, since he was the main vehicle for exposition in the Middletown stories, but what role did Diane Meade play? Even if she were a legitimate love interest, how would that affect Zook as The Lover? Surely we need a better constructed model for supporting casts, but Schmidt does rightly point out that the relationship between Zook and J'onn needed to be better explained, especially as it wound down and Zook vanished altogether. 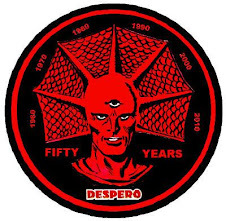 * I also got started on Despero, but I guess that'll sit in a queue until December. On most of these pieces, I've taken a cue from an instance of Alcatena's having written the title of a story he was adapting on the actual art in titling these spotlights. I can't do that here, because Alcatena is referencing two different stories, "The Man Who Destroyed J'onn J'onzz" from Detective Comics #322 (December, 1963) and “The Giants Who Slept 1,000,000 Years” from House of Mystery #153 (September, 1965.) 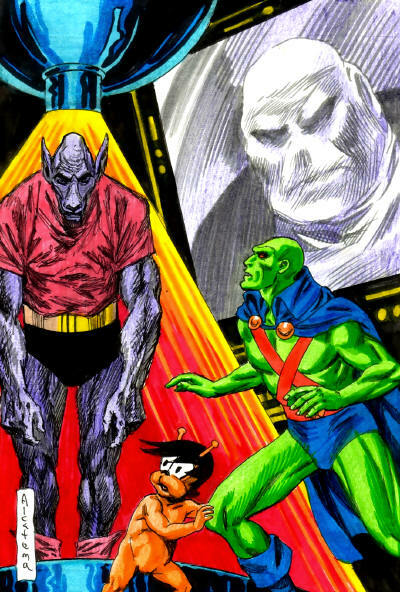 These are two of the finest Martian Manhunter stories of the Silver Age, and not coincidentally, both feature the menace of Professor Arnold Hugo. Zook joined the Alien Atlas in his first encounter with the Batman villain, where both were lured to the lab seem above. 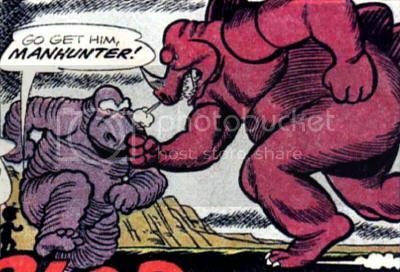 In their second encounter, the Manhunter faced a giant-sized Hugo on his own. By combining three of my favorite Sleuth from Outer Space characters, Alcatena also offers one of my favorite pieces in this series! Be sure to check out more at Quique Alcatena! 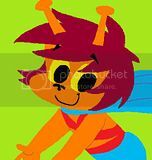 I couldn't find any details on who created this or when, but will add them if found or offered. 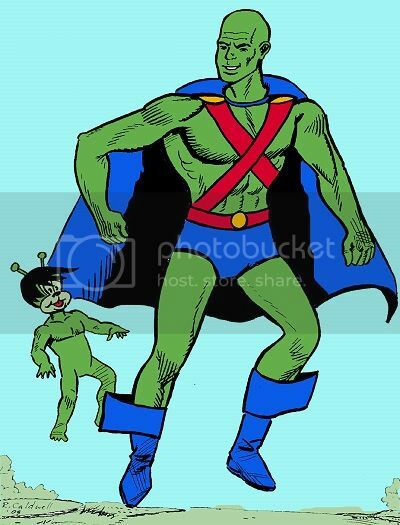 "I need to ask Roger what that little critter was next to the Martian Manhunter. I just guessed that he was some kind of martian too." Said the colorist Tim, not knowing who Zook was. 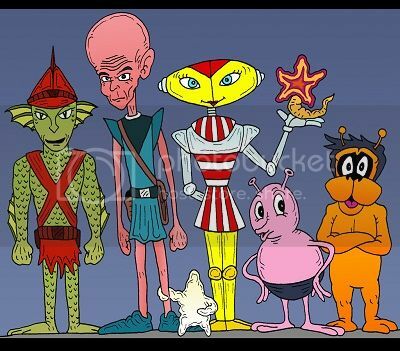 S'tor (not to be confused with S'vor) was a normal Martian of unrevealed background who acquired two capsule-shaped space ship of unknown origin and joined six other Martians on a trip to Earth's moon. Acting as a scout for his group, S'tor landed his single seater on terra firma and assumed the form of a more simian Martian Mountain M'mannix to go on a rampage near the Deauville Beach area. His intention was to test the strength of the Earthlings in advance of an invasion attempt. S'tor was confronted by J'onn J'onzz, the Manhunter from Mars, leading to a brief fight. S'tor managed to evade capture, escaping back to the moon in his capsule. Two ships soon returned, with seven Martian Marauders spoiling for a fight. With modest, indirect assistance from his sidekick Zook, the Manhunter sent the lot packing back to their ships, which crashed into one another while trying to maneuver away from further pursuit. The capsules were utterly destroyed, and the Marauders were never heard from again. 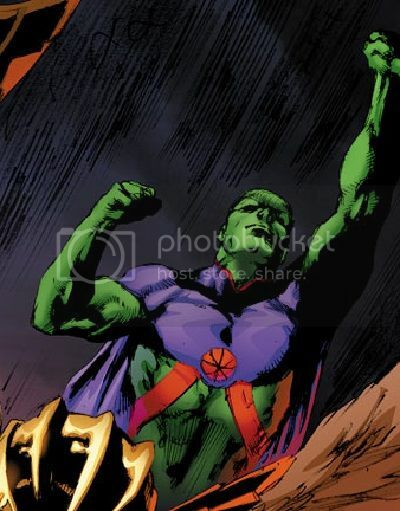 While the Martian Mountain M'mannix has been acknowledged as being much more powerful than a normal Martian, and J'onn J'onzz has at times assumed all the strengths and weaknesses inherent in a life form that he has shapeshifted into, S'tor enjoyed no such benefit. 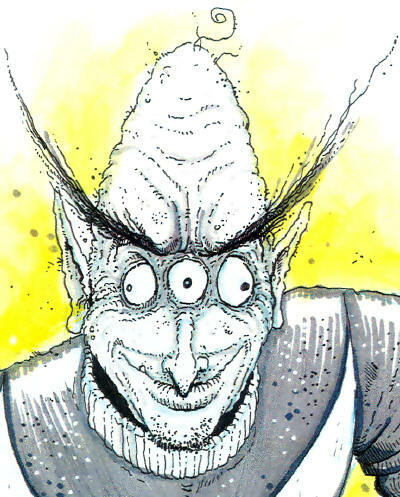 Despite his size and appearance, S'tor demonstrated no greater abilities than the Alien Atlas, and may in fact have been handicapped in some unexplained fashion. 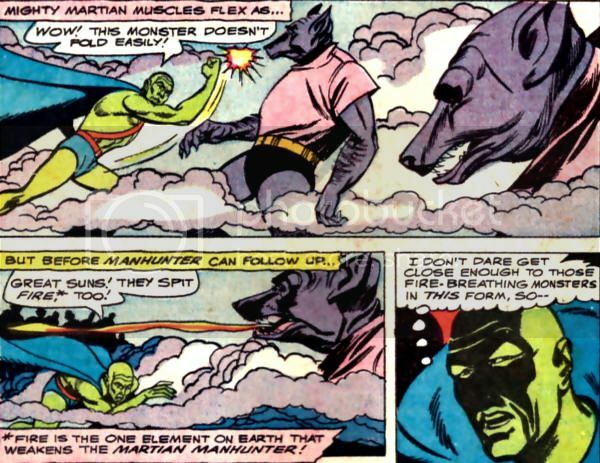 While unknowingly exposed to an area with an open flame, the seven Martian Marauders in the form of M'mannix proved inferior to J'onn J'onzz in combat. Apparently, passing near a small flame held by Zook ahead of the Manhunter was enough to exhaust most of the Marauders' capabilities without effecting J'onzz. 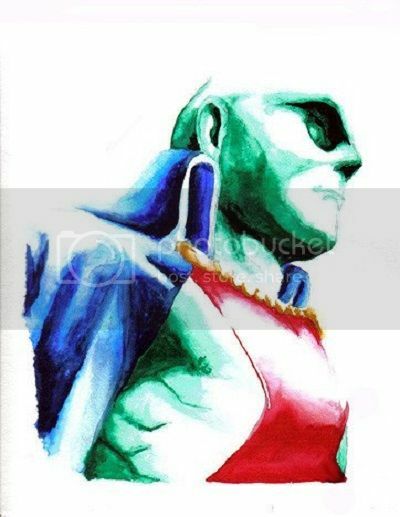 Perhaps other factors contributed, such as J'onzz's skills, greater time spent empowered on Earth, or some other unrevealed quirk/precaution that favored the Manhunter. Regardless, the Marauders appeared to rely solely on brute strength of levels equal to or less than common for their natural species, to their detriment. The origins of the Marauders' capsules was not revealed, although they may have been Martian, based on S'tor's asking of J'onzz "How did you manage a trip to Earth, before the invention of space ships on our planet?" I could have tried to score another part for a little person as a naked Chinaman toddler caricature Teletubby, but I don't think they need that kind of help, and Zook isn't built for live action anyway. He's more of a Roger Rabbit cel animation superimposition, or at least a rubbery CGI construct. That translates into needing a voice actor that can take Zook's problematic speech patterns and otherdimensionalness to a place that they could be embraced by an audience. I'm not a connoisseur of animation, so that meant research. The first fellow who seemed like he might work was Steve Blum, who played a Digimon character that broadly fit Zook, but he seemed to specialize in tougher sounding characters. Frank Welker was obviously an option, as he's done thousands of cartoon characters across decades of animation, and his reels were full of Zook-appropriate performances. However, even I've heard of this guy, so Zook would just be another forgettable gig to him. I briefly thought of John Byner, who I loved as Gurgi in The Black Cauldron, but that would just be stealing. Also, Welker is 67 and Byner is 75, so we're really pushing the boundaries of retirement/death at this point. 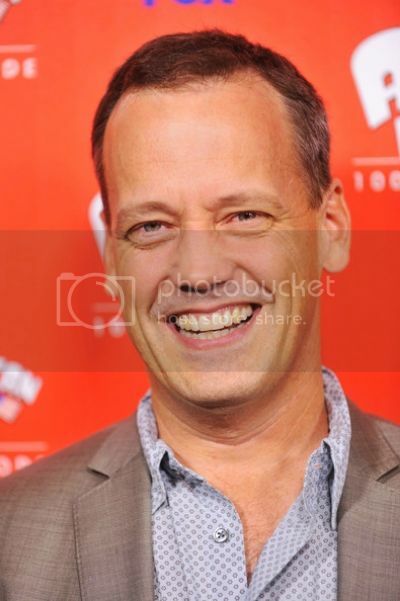 Ultimately, with a nudge from Count Drunkula, I settled on Dee Bradley Baker, a comparatively young 51 and the go-to guy for sounds that cannot be easily obtained. Horses neighing, monkeys howling, critters chirping; that sort of thing. He's had notable dialogue roles on popular shows, but I wouldn't say he's had the role in that department that Zook's unique orientation could provide. Further, Baker could voice the various monsters unleashed by the Diabolu Idol-Head, so he just keeps winning. For more, listen here. 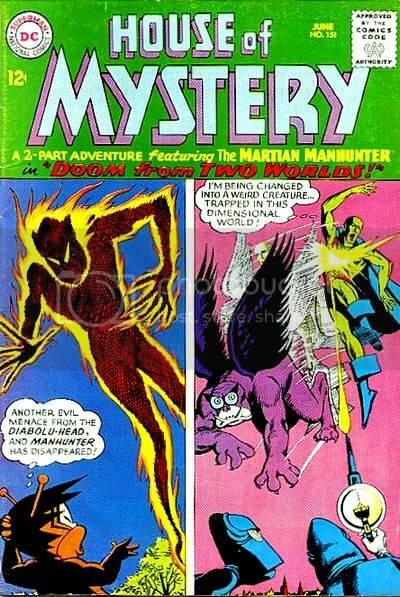 The Martian Mountain M'mannix was a "dumb beast" that was "wild and deadly," described as being as indestructible as a more humanoid Martian but "twice as powerful!" The creature has not appeared in any comics, but a group of Martians once shape-shifted to take on their form as part of an invasion plot against Earth. 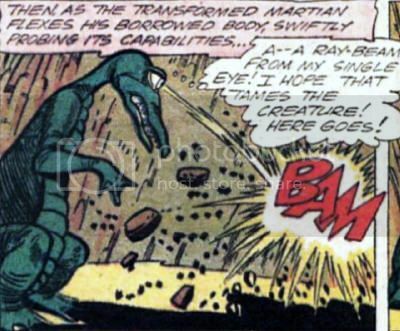 A non-canon splash page showed a "M'mannix" breathing a spray of flame out of its nose, a power not demonstrated by the regular Martians featured in the story. The crime organization Vulture once created a "transfer-ray" that could turn their human goons into powerful creatures with canine features. These "monsters" were driven by automobiles to sites where they were employed in major thefts, then driven back to a Grecian Vulture base, where their humanity was restored. Although Vulture rotated out sets of agents for each job, it seemed that multiple transformations on a single subject were a possibility. 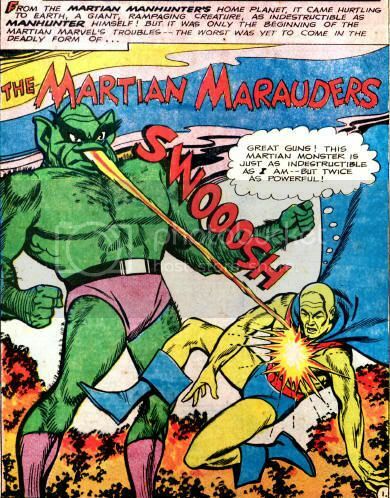 However, the ray was soon destroyed by the Martian Manhunter. The "monsters" were tall, strong enough to smash through well fortified walls, and were resistant to injury from superhuman blows, though they could seemingly be killed by conventional weapons. They could "spit" streams of fire from their mouths, as well as expelling "smokescreens" to obscure their immediate area. The "complexity" of the ray's transformation once locked the Manhunter in monster form when he tried to duplicate the Vulture operatives, requiring exposure to the transfer-ray to be restored to Martian form. Despite their mass and stature, the "monsters" appeared to be quite swift and exhibited human-level agility. The transformed could think and speak with relative normality while in monster-form. Quote: "Don't worry! I'm coming!" "Thank you for posting my pin-up, Frank! I´m a devoted fan of the Miller/Certa´s years, and I loved trying to recreate their particular charm in a series of illos. 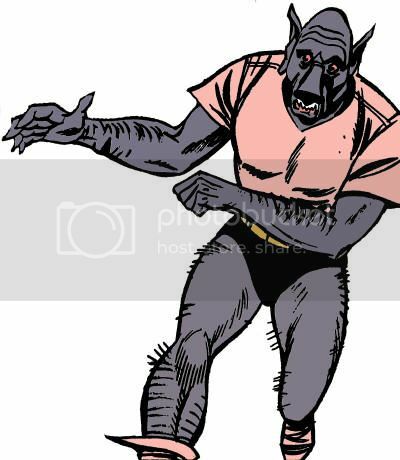 All the best, Quique Alcatena"
After a decade of development, top scientists from the international criminal organization Vulture completed the "transfer-ray," which could transform agents into large, vaguely canine anthropomorphic "monsters." 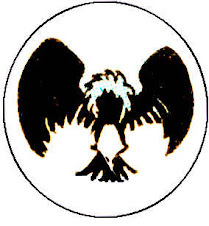 For reasons unrevealed, Vulture would only alter three agents at one time, individually, through one known transfer-ray. Two recorded heists were performed before the Grecian base housing the ray was uncovered by J'onn J'onzz, the Manhunter from Mars, and the known transfer-ray was destroyed. A short time later, Vulture appeared to be dismantled and its once faceless leader Mr. V unmasked, so it is unknown if any additional transfer-rays were ever produced. "11.25x16.75 sheet of art paper has 9x13-1/8" image area in ink and colored markers. The Martian Manhunter, aka J'onn J'onzz has word bubble reading "Sigh!" 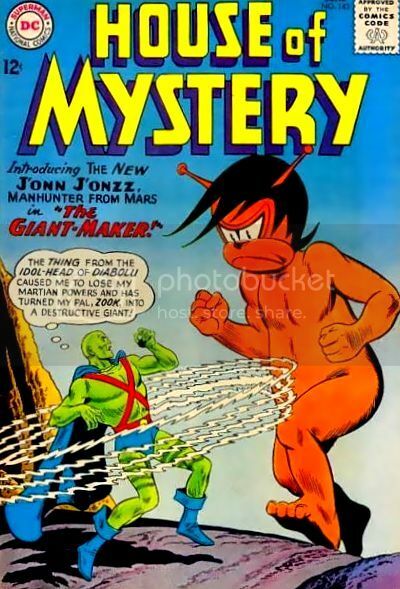 as a giant version of his friend Zook appearing just as he did on the cover to "House Of Mystery" #143 (Martian Manhunter's first appearance in what would become his home title in June, 1964) looks over his shoulder while J’onzz holds copy of "House Of Mystery" #143 comic book (the front cover being a hand-colored stat). Created in 1994, art is signed in ink "Dave Fontaine 94" at lower right. Blank top margin has strip of masking tape holding protective acetate cover sheet in place. Image area is Exc. Well done. From the Robert M. Overstreet Collection and comes with COA." Was this art featured in one of the Overstreet price guides, I wonder? Obviously the Zook is heavily referenced from Joe Certa's original cover, but there's a heavy Kevin Maguire look to that face, as well. Not that I care, because this is ginchy and a certified classic antique! Usually with a simple "super deformed" image like this, I'd have a link list of different characters by the same artist across my DC blogs. Curiously though, he only did Superman, Batman, Green Lantern John Stewart, Wolverine and the Silver Surfer. Personal favorites? Interesting company regardless! "Some alien fun from deep deep in the DC universe." Can anyone name the lot? 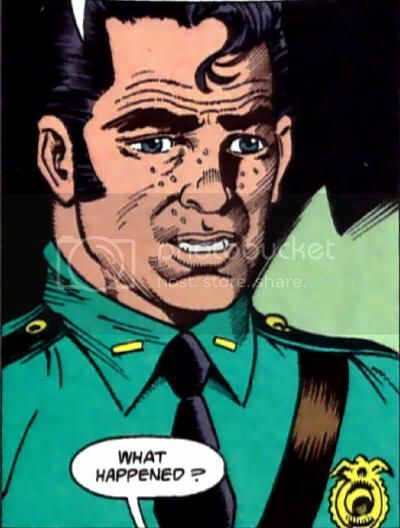 Thanks largely to "The Ambush Bug History of the DC Universe," I know Proty, Ilda, Itty, Cryll, and of course Zook, but I'm at a loss on the first two. Jero & Halk? I never read "Space Cabbie."